It seemed like a good idea when I told my teammates that I’d join them at the Step Up for Kids, a stair climb race where participants climb 38 or 80 floors of the Aon Center. My tentative plans to ski fell through, husband had to work, and this stairclimb was one that I wrote about more times (four, I think) than I had actually participated (a big fat zero). Add in the fact that it benefits Children’s Memorial Hospital—a spot near and dear to husband’s heart—and the more than 148,000 kids that will visit the hospital for treatment, and I was sold. Not only because I never turn down a workout, especially one with as rewarding a view (promised by ABC 7 reporter John Garcia, who I’ll be climbing with) but also because it was my way of supporting my husband’s daily toils. 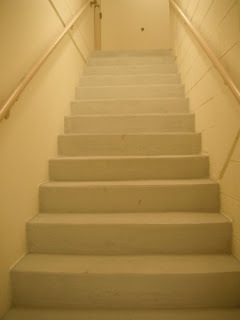 There’s one problem: I forgot how strenuous stair climbing can be…especially when you NEVER climb stairs. I live on the 13th floor—the only stairs I’m climbing are when the elevators break down. As I was so kindly reminded, stairs offer one heck of a calf workout (and glutes and quads, too). That’s good for anyone who wants killer legs when they’re sporting heels and skirts, but most of my running injuries, er ailments, stem from tight calves. The last thing I need is to put them into overdrive and curtail my running season after it barely has started. And I’m rusty. I did the math and realized that my last stair climb race was the 2008 Hustle Up the Hancock (a 94-floor climb to the top of the John Hancock Center). While I’d like to hope that anything would be better than that lung burner—“altitude training” from four day skiing in Colorado does not work when you’re climbing stairs—I have a feeling that I’m in for just as much of a killer workout. The heart racing, the blood rushing, the limp-leg feeling, the panting, the sweating, the I’m-about-to-pass-out-unless-I-reach-the-finish-line-now suffering. Maybe, just maybe, the 14-floor deficit will be on my side? Probably not--thanks to my complete lack of training unless you count the four floors I climbed when the elevator broke at the yoga studio. But the intensity I'll get in the 15 minutes it'll hopefully take me to reach the top (provided I'm not too ambitious) is enough to count toward my Sunday run. Even better: It's indoors so I don't have to weather the elements that I dread this time of year. And I think I can safely say that I've earned the nap I'm already planning after the post-party. Bring. It. On. Stair climbs are hard! I did the hustle last year with a team at my then work. All the girls kept steady paces the entire way and some of the boys bolted from the start...and all of us passed two of them in some serious pain a little over halfway up. We were all winded and tired and we all use the stairs at work....me specifically, every shift i'd walk up 10 flights to my floor! I think the 14 floor deficit will be in your favor...it'll be over sooner! Nina! You're right, the stair climb was hard, even though I only had 80 floors to climb this time, and not 94. So happy to reach the top! :) Nice that you passed some of the guys at the Hustle, I think that steady pace is key. I officially feel lazy after reading that you'd walk up the 10 flights to your floor :) Are you doing the Hustle or any other stairclimbs this year?